Inventory Management is key to running a successful online store and Kyozou’s online inventory management system makes it easy. With Kyozou’s fully loaded ecommerce inventory management software, you can stay organized with custom storage locations and multiple warehouses. Easily assign your inventory to a location with barcode scanners or via a feed file. Import/Update inventory in bulk with a feed file or manually input your inventory searching the eBay and Amazon catalog. Our industry leading feature of instant quantity management means all your inventory in all your different channels is updated instantly to provide real time data to avoid under/overselling. Kyozou is ecommerce integration of your ecommerce store, eBay, Amazon and Newegg into an all-in-one easy to use account. 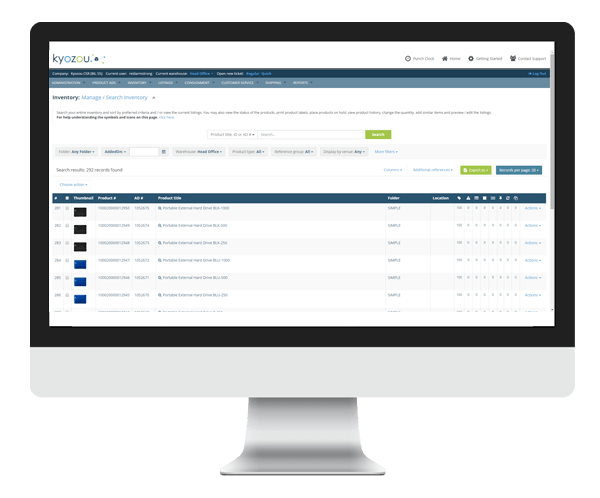 Find out about more great features within Kyozou’s ecommerce and multi channel inventory management tool. Warehouse inventory management has never been easier with our system. By setting up multiple warehouses in Kyozou you’re able to keep your inventory segmented for all your different locations while at the same time managing your multi-channel listings from a single Kyozou account. Each warehouse has the ability to be setup with its own individual Kyozou Webstore or to have all warehouses feed to one Kyozou Webstore. Each Kyozou account can be created with up to 10 warehouses giving you control and flexibility in aligning the listing management software to match how you operate your business. Stay organized with the ability to create custom storage locations. You can easily assign your inventory to a location and know exactly where your products are when it comes time to process an order. Update your inventory in bulk via a spreadsheet or manually enter locations with a barcode scanner or the Kyozou user interface. Kyozou works with industry standard Zebra thermal printers for all your label needs. Save time by organizing and adding inventory to your account with a barcode scanner. Scan a location label then scan a product label letting the Kyozou system know exactly where your items are stored. Scan a product barcode and search the eBay catalog for pre-compiled product information. Kyozou works with all types of barcode scanners and our classic interface has been optimized to work with windows CE operating system (giving users on windows CE scanners) a simple/intuitive user interface to keep their inventory organized. With the ability to import and update inventory from a spreadsheet, getting your products into the system is a breeze. Setup feed files to quickly update your live listings with new quantities. Replace and override all your product images by utilizing hosted image URL’s into a spreadsheet. Add fitment data in bulk. Export data options throughout the entire user interface allow you to gain access to your valuable product information. From our user friendly ‘manage products ads’ module, updating your inventory in bulk is simple. Select the products you wish to update and, from our options list, revise your inventory in bulk. Want to convert all your auctions to GTC listings (Good ‘Til Cancelled) in a few clicks or how about update your entire inventory to a new eBay listings template? With Kyozou it’s easy. Gain a complete comprehensive breakdown of the history of your products, with dates, time-stamps and more. Who created the item? Who listed it? When was the last sale or how much did an item sell for? The history of a product is very useful for management and can help keep your business running smoothly by keeping people accountable for their actions. Kits and Bundles are one of the most efficient ways of keeping track of your inventory in your online marketplace at the same time opening up new sales opportunities. With Kyozou you can list both an individual item while simultaneously associating that product’s quantity to a bundled listing. As quantity depletes from either the individual listings or the bundled listing, Kyozou will automatically adjust the inventory quantity on all associated listings to make sure you are not over or under selling. It’s listing management made easy.